The stethoscope is an instrument for listening to sounds produced by organs in the human body, including the heart and lungs. One end of the stethoscope is placed against the body, and the other end is placed in or at the ear, a method called direct auscultation. The sounds are then interpreted by an experienced listener. In the late 1700s Leopold Auenbrugger (1722-1809), a Viennese doctor, developed a technique called percussion. Auenbrugger tapped on his patient's chest and then analyzed the different sounds he heard. He published his findings in a pamphlet in 1761. The pamphlet was ignored by the medical profession until the early 1800s. At that time, Jean Nicholas Covisart (1755-1821) adopted Auenbrugger's percussion technique. Covisart translated Auenbrugger's pamphlet into French and encouraged Rene Theophile Laennec (1781-1826), one of his students, to study acoustic diagnosis. Laennec invented the stethoscope in 1816 during an examination of a young woman with a heart affliction. Laennec was unable to put his ear to the woman's chest to evaluate her condition. This was both because the patient was a very large woman and because moral standards of the day considered such an examination to be immodest (indecent). In a burst of inspiration, Laennec rolled a sheaf of paper tightly into a tube. He placed one end of the tube over the patient's heart and listened from the other end. The doctor later wrote, "I was both surprised and gratified at being able to hear the beating of the heart with much greater clarity and distinctness than I had ever done before by direct application of my ear." Laennec made a later stethoscope from a wooden tube. In 1819 Laennec wrote a book describing his instrument and the diagnoses to be made with it. To help promote the book, the publisher gave a stethoscope with each book purchase. Austrian doctor Joseph Skoda (1805-1881) promoted the use of the stethoscope. He was very instrumental in popularizing its use for diagnostic purposes. Various improvements were made to the device over the years, including the use of pliable (flexible) tubing, introduced in 1850. In 1852 American doctor George P. Cammann developed a binaural stethoscope, a stethoscope with an earpiece for each ear. The next major development in stethoscope design came 100 years later, when the electronic stethoscope appeared in 1980. One application of an electronic stethoscope is the fetal monitor, which is used to listen to a unborn baby's heart rate. With the "external" monitor, the heart rate is heard through belts placed around the mother's abdomen (stomach). With the "internal" monitor, the heart rate is heard through a wire that is attached to the baby's scalp. 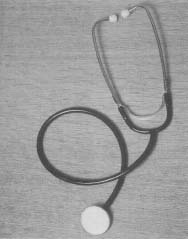 A modern stethoscope. The stethoscope is an instrument for listening to sounds produced by organs in the human body, including the heart and lungs. One end of the stethoscope is placed against the body and the other end is placed in or at the ear. The advantage of electronic monitoring of the heart rate is that the monitor provides continuous listening and can pick up uncommon patterns, then can sound an alert so that medical personnel can take immediate action. That action is almost always to deliver the baby by Cesarean section (abdominal surgery), then to guard against oxygen starvation, which may occur with a faulty heartbeat and ultimately result in brain damage. Electronic stethoscopes are also being studied for their usefulness in areas where the patient is remote (distant) from the physician, a form of diagnosis called telediagnosis. The quality of the information obtained from the electronic stethoscope compared very well with direct, or conventional, auscultation. The method brought the information, or data, to the physician using a modern and a standard telephone line. When pitted against direct auscultation, the electronic stethoscope missed some faint heart murmurs, so the standard stethoscope-—which doesn't need electricity to work-—remains valuable and widely used. Its portability, low cost, and ready availability make the stethoscope an ideal basic tool.